NASCAR visited the beautiful surroundings of Watkins Glen, N.Y., located in the finger lakes region of western ( upstate) New York. The track was the former home of the U. S. Grand Prix ( Formula One Racing). This is the second race of the season on a road course for NASCAR. The differences between Infineon Raceway and Watkins Glen are many. Watkins Glen is a higher speed road course with only a little elevation change, and RAIN!!! The track is a few feet wider and that does allow for a bit more passing than Infineon Raceway. Road courses offer a different strategy in racing. Instead of calculating how far you can go in a fuel run, road couses dictate that you work backwards. These two races, Infineon and Watkins Glen, are shorter in duration, typically 200 miles. So as a crew chief you work backwards from the last lap and schedule your pit stops at the first opportunity that will alllow you to get to the end on fuel and tires!! Having that information will make you understand just how easy it is to make a mistake in your pit strategy! Therein lies what Tony Eury, Jr. had to deal with during the race Sunday. He kept Dale Jr. out too long and that strategy totally backfired on the #88 crew chief!! Road courses are not known for huge crashes. However, Sunday there was a big crash with ten laps to go that caused a 45 minute Red Flag delay. Coming out of turn 11 Michael McDowell ran David Gillilland out wide and into the fence. 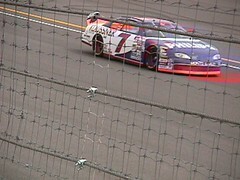 Gillilland hit the fence and bounced back out on the track right in front of Bobby LaBonte. Labonte T-boned Gilliland and the whole race track got cluttered with trashed out cars. Forty-five minutes later the race was restarted and TLVW, aka ol Kylie Busch, was leading the race. Once again nobody had any thing for TLVW and he posted his eighth win in Cup this year!! Just remember, last year Jeff Gordon ran away with the points lead but was unable to close the deal with the championship. So don’t be too quick to give the championship to Mr. Las Vegas Weasel yet!!!! Since I was in Atlanta doing my “family thing” ~ I didn’t get to see the race, but I do know that I ate a ton of points…! Hopefully, my lil’ sweetie ~~ “KYLIE” ~~ will be good to me in Michigan and bring it home, once again… Yeah, I know ~~~~~~ he gave you a ton of points when you had him, but he found out how you bash him and call him the LVW and decided to show you … You were right about Newman, he is going to go with my other favorite “SMOKE”….. Isn’t it fun to like different drivers, live under the same roof and still like each other !!!!!!!!!!!!!!!!!!!!!!!!!! !